Modern Taiwanese culture blends Chinese, Austronesian, Japanese and Western influences. 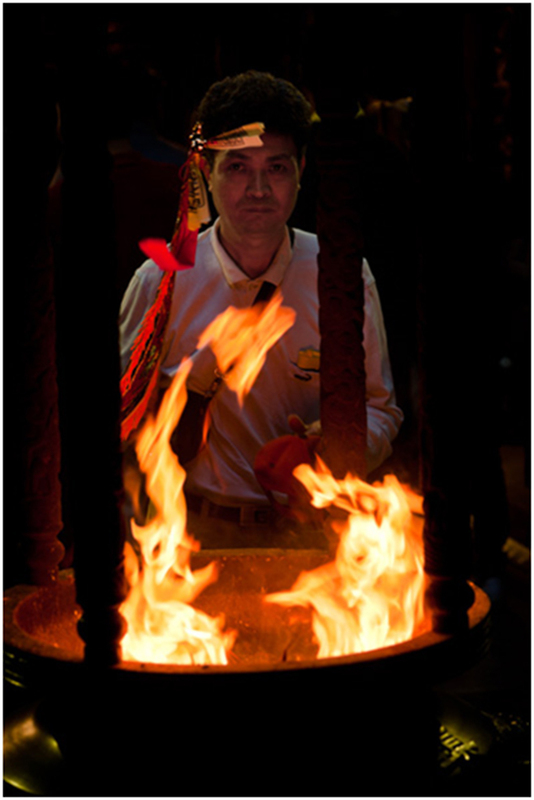 Because Taiwan never experienced Communist oppression, visitors have opportunities to witness traditional religious practices and ancient customs that have disappeared from the Chinese mainland. As a consequence, Taiwan is sometimes said to be ‘more Chinese than China’ while at the same time being ‘much more than Chinese’. Taiwanese families are close-knit and extended. Most Taiwanese people stay very close to their parents, even after they’ve married. Many Taiwanese parents offer their grown-up children a degree of support – some may see it as interference – that surprises Westerners. It isn’t unusual for parents to buy houses for their children or choose what subject their youngsters study at university. Three or more generations living in a single household is still very common. In many families, it’s still expected that the oldest son will bring his wife to live with him in the house where he grew up. But some newlyweds have little choice, however, because houses in major cities are very expensive and salaries for many Taiwanese remain quite low. Young people fresh out of college seldom earn more than US$1,000 per month. Deference to those older than oneself means more making offerings of food and joss paper to ancestors and showing respect to one’s parents and grandparents. Younger siblings are expected to defer to their older brothers and sisters. Even in the case of twins, the one born mere moments earlier will throughout life be considered the ‘older brother’ or ‘older sister’. For many ethnic Chinese, ancestor worship is more important than Buddhism, Taoism or other faiths. Christianity’s opposition to ancestor worship is one reason why the faith hasn’t gained much ground in Taiwan. The key point of ancestor worship is that living descendants provide those who’ve passed away with the means for a happy existence in the afterlife. Ancestors are both loved and feared; if neglected by their sons or grandsons (daughters are expected to marry and make offerings to their husbands’ ancestors), they may deliberately harm their descendants. Ancestor shrines can be found in many households, sometimes in the front living room, often upstairs. Festivals have long played a major role in Taiwanese society, and in recent years they’ve become a major driver of the tourist industry. 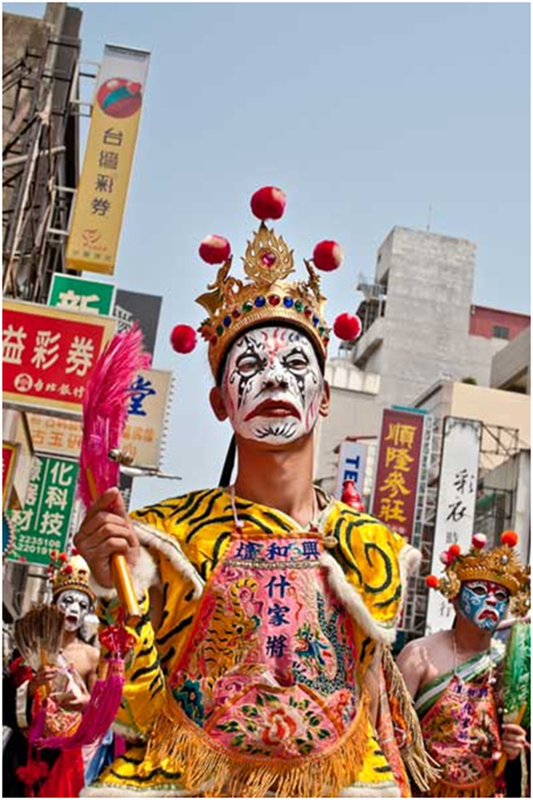 There are sound historical reasons for this: Long before Taiwan became the affluent society it is today, events like gods’ birthdays and pilgrimages were colourful distractions from daily life. For ordinary people until well after World War II, festivals and family events like weddings were the only opportunities they had to feast, relax and travel to the next town. For Taiwan’s aboriginal minority [JDL], festivals are a way of expressing and consolidating their identity, as well as a source of tourist dollars. Most festivals are planned according to a traditional calendar invented in China at least 3,000 years ago. In English, it’s usually called the lunar calendar. Pious individuals depend on the calendar (which indicates both the point in the solar year and the phase of the moon) to know when they should burn joss paper and avoid meat. Several major celebrations, such as Lantern Festival, build on customs migrants brought with them from the Chinese mainland. Lantern Festival concludes the Lunar New Year season, and gets its name from the colourful lanterns which bedeck temples and streets. In the days of yore, these lanterns were made of paper and bamboo, so small a child could carry one, and illuminated by a burning wick. Thanks to technology, they’ve grown much bigger and better. They may be any shape, larger than a house, and showcase state-of-the-art visual trickery. Taiwan’s national Lantern Festival is held in a different city each year, and lasts for several days, usually around the end of February. Martial arts are as Chinese as chopsticks, but Taiwan’s special history combined with the tradition of unarmed combat has given birth to one of the island’s most exciting events. 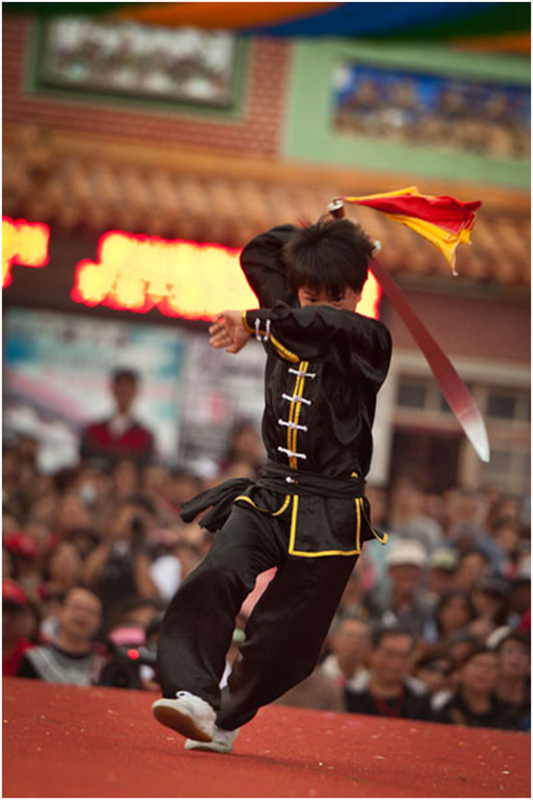 Neimen, a small town in Kaohsiung’s hinterland, is now famous for large-scale martial-arts displays during the annual Song Jiang Battle Array. The festival, held each spring around the time of Guanyin’s birthday, celebrates the tradition of temple-affiliated militias. The tradition has been especially strong in Neimen since the late 17th century. Because Neiman was then dangerously close to aborigines who occasionally raided ethnic Chinese villages, military skills passed down from father to son were useful useful. Battle-array members are expected to uphold core values such as physical strength, loyalty and mutual support. Whether they’re engaged in ritualised dueling (swords may be used against axes, and umbrellas may be deployed in fights against those wielding hoes) or drilling, you can expect to see impressive coordination, suppleness and speed. The Qixi Coming-of-Age Ceremony grew out of a coming-of-age rite that’s been celebrated in Tainan on the seventh day of the seventh lunar month each year since the 18th century. Back when Taiwan was part of the Qing Empire, families celebrated when a boy turned 16, because if he worked on the docks, in a warehouse or a shop, he then qualified for a full salary, not the half salary paid to those 15 or younger. Tourists are welcome to witness the touching and highly photogenic ritual at Kailong Temple. Boys and girls (females are now allowed to take part) who’ve just turned 16 year crawl under an altar while dressed in special clothing, shoes and hats. At the same time, their parents make offerings of duck, chicken and red rice cake. Afterward, some of the young people proceed on horseback to the Confucius Temple to offer incense to China’s greatest philosopher. The 23rd day of the third month on the lunar calendar is Mazu’s birthday and a day of celebration in every part of Taiwan. Temples in which Mazu is the principal deity become hives of good-natured activity. However, the most remarkable expression of faith occurs a few weeks earlier, during the nine-day, eight-night Taichung International Mazu Sightseeing and Culture Festival. What used to be a mass pilgrimage has evolved into a multifaceted religious and cultural extravaganza. The key event is a 350 km trek from Dajia in Taichung to Xingang in Chiayi and back again. Dajia’s main Mazu icon is carried the entire distance, while crowds of pious participants follow on foot. Along the route, believers crowd the road, hoping to gain Mazu’s blessing by either touching her palanquin or lying prostrate on the road ahead of the procession so the icon is carried over their bodies. A million or more people join in, and the festival is said to be largest religious gathering in the world outside India. Even if you never set foot in a Taiwanese temple, you’re bound to come across folk-religion parades. These are traffic-stopping events in more than one sense – not only do the crowds of performers and devotees often block the thoroughfare, but the noise and colour are sure to make you pause, watch and take lots of photographs. A typical inspection parade begins and ends at a temple, and involves transporting an effigy in a palanquin. This may be a wooden sedan chair, or even an ornate wheeled buggy equipped with flashing LEDs and loudspeakers. The god is preceded and followed by men and woman carrying banners and placards or playing gongs, pipes and huge drums. Frequent stops are made to bless individual businesses or households. At each halt, strings of firecrackers are detonated, joss paper is burned and fireworks launched into the sky – even when the beauty of the pyrotechnics is lost because of bright sunshine. After the rites have been concluded, the parade moves on. The most eye-catching participants are known as zhentou. These performance troupes (some professional, many amateur) wear fabulous attire, walk on stilts and perform acrobatics. The best known are the Bajiajiang, usually translated as the ‘Eight Generals’. The eight members (almost always men) represent four ‘infernal generals’ plus the four seasonal gods of spring, summer, fall and winter. The vaguely menacing attitude they show when swaggering along the street is heightened by the ritual weapons they carry. Every aspect of their appearance is decreed by tradition, and their clothing and makeup is a photographer’s dream. The Austronesian tribes who live in the western part of the island have long been exposed to Chinese culture. Nevertheless, they’ve still managed to preserve a considerable amount of their culture, and regard festivals as both important opportunities to showcase their arts and customs to outsiders while transmitting their traditions to younger generations. One of the most accessible events is the Ear-Shooting Festival. This is the Bunun people’s most important celebration and it’s known as mala-ta-ngia in the tribe’s language; its historical links with the tribe’s hunting culture are obvious from its name. Held in south Taiwan in late April or early May, the festival gets its name from displays of archery skills in which tribesmen shoot at animal ears nailed to a post. That’s just one aspect of the event, which now includes contributions from neighbouring tribes plus traditional aboriginal food. 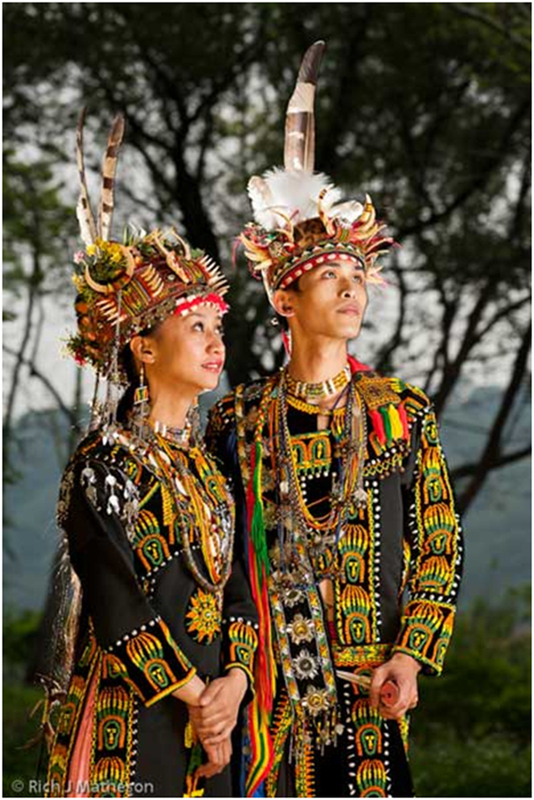 In East Taiwan, the Amis Harvest Festival is an excellent opportunity to see living, breathing aboriginal culture. Each of the 40 or so Amis settlements in Hualien and Taitung holds its own celebrations just after the rice crop has been taken in, and each event lasts three to seven days. Through songs and dances, members of Taiwan’s largest aboriginal tribe express their gratitude for bountiful crops, and seek the blessings of spirits and ancestors. On the final evening, romance is in the air as this is one of the few situations when girls are allowed to show their interest in boys. The Mgay Bari is the major annual festival of the Truku tribe, who live near Taroko Gorge. Originally, the core of the event was offering sacrifices to their ancestors, but in the past decade the festival has evolved into a general celebration of tribal culture. Truku myths and legends are retold through traditional songs and dances, so it’s a fascinating experience for world-music enthusiasts. Aboriginal arts and handicrafts are sold during the festival, and you’ll not hear any angry word from anyone – for the duration of the Mgay Bari, quarreling and fighting are strictly taboo. For the indigenous people who live on Orchid Island, flying fish is a traditional foodstuff of great cultural as well as nutritional importance. Fishing is done in beautiful hand-built wooden boats, the construction and use of which is surrounded by customs and taboos. Islanders begin fishing in late spring, only after they’ve held a sacred ceremony which they believe will attract the fish. Men sing; woman clap. The catch is shared out by type in accordance with custom. Black flying fish, for instance, are a particular favourite and so saved for esteemed visitors.